For some wine snobs, a trip to Napa is all about finding the top-rated wineries to visit. For the rest of us, it's a chance to enjoy some excellent wine in an iconic and beautiful area. We set out to make this winery guide different. First, the wine has to be good. More importantly, the winery and its staff have to deliver an experience that you'll remember, one that you will hopefully still be talking about months if not years from now. One list isn't enough, either. Everyone has different things they want to do, and no one list of "best" wineries fits all. Keep reading to find the best tasting rooms, best tours, top food and wine pairings and some cozy, boutique wineries you'll love to visit. We couldn't get to all of the Napa Valley wineries ourselves, so we collaborated with a couple of experts to create these lists: Jesse Warr of A Friend in Town and Rick Spear of Blue Heron Tours. Find out the best time of year to go to Napa - it may not be what you think. If you only have one day to see Napa Valley, you'll definitely want to use the tips in the Guide to Doing Napa in a Single Day. And you'll need to know how to survive a day of wine tasting. If you have a little more time, learn how to spend a weekend in Napa Valley. There's plenty to do on a family trip to Napa, too. Get some ideas for taking the kids to Napa. The typical, traditional Napa tasting room visit is so predictable: Walk in. Feel lost for a moment. Head for the bar. Someone will pour you a splash of a current wine. Wait while the server helps a half dozen other people. Get another sip of wine. Listen to the pourer talk about the wine using words you may not understand. Oh - and pay $25 or more for the pleasure. After a couple of random stops, that same old pour-sip-pour-sip routine gets monotonous. If you're looking for a really special, fun day out in Napa with some tasting experiences you may never forget, this list is for you. It includes only places where I have personally enjoyed their wine tasting enough to tell my friends about it. These winery tasting rooms offer wine tastings in beautiful surroundings, and they give each guest personal attention. All fo the are great: They're simply sorted in alphabetical order. Del Dotto Wine Gallery: They call it a tour, but I call the Del Dotto experience wine-tasting because you focus on only part of the wine-making process. Taste as you go, sampling directly from barrels to get an insight into an often-overlooked part of the winemaking process. We like their original location just outside of downtown Napa better than the newer one on CA Hwy 29. Kuleto Estate: We love the laid-back ambiance and friendly tasting room staff at Kuleto. Expansive views from its hillside location above the valley make for a memorable tasting experience. Raymond Vineyards: Stylish and chic, with one of the most unusual tasting rooms in Napa Valley, Raymond is a refreshing break from the stuffy, traditional winery scene. It's also one of the few places where I liked every single wine they poured. Opt for their premium tasting room called the Crystal Cellar, where Baccarat crystal chandeliers and mannequin angels hover overhead. Sullivan Vineyards: At first glance, Sullivan seems a little old school. What sets it apart is their top-notch wines served in a lovely setting and their employees' unpretentious attitudes. Secret Pleasure: Although they offer a more traditional style of tasting experience, tour guide Jesse Warr of A Friend in Town says his guests always like Kelham, a "small, family-run venue where you get very personal service and excellent wine." Skip This: Darioush Winery has a gorgeous building and a very inviting-looking tasting area. Sadly, my experience there was quite disappointing, with rushed and inattentive service that left us sitting by ourselves nearly the entire time. At some wineries, the only thing you can do is taste their wine - and maybe do a bit of browsing in the winery's gift shop. Others offer self-guided tours that offer a little information but seem impersonal and shallow. If you're looking for a really great winery tour that includes something different and memorable, these Napa Valley wineries offer fun, interesting tours in beautiful locations. Winery tours vary in length, but to avoid sensory overload and a feeling of being too rushed, it's best to choose only one to do in a day, along with a couple of other winery visits. Make a reservation at any winery in advance, and you'll get a better experience, with group sizes controlled and less waiting. At these places, they're not just a good idea, they're essential. Del Dotto Wine Gallery: The Del Dotto experience is both a tour and a wine-tasting experience with an emphasis on how the barrels affect the wine's flavor. You taste as you go, sampling straight from the barrels to discover how wood and wine interact to build flavor. We like their original location just outside of downtown Napa better than the newer one on CA Hwy 29. Jarvis Winery: This winery is built completely inside a cave, pouring some of the best-tasting wines we've ever sampled, a less-known find that you can brag to all your friends about. The cave is fascinating even if you're not a wine snob. Long Meadow Ranch: I haven't had the pleasure of trying this tour, which takes you to visit the entire "ranch" where Long Meadow produces not only wine but other yummy food products. As a long-time fan of their Farmstead restaurant, I expect it would be wonderful. Schramsberg: The original winery at Schramsberg is one of the oldest in Napa Valley, and their tour includes caves that were hand dug by Chinese laborers. You'll also get a look at some of the painstaking processes Schramsberg uses to make their award-winning sparkling wines. Castello di Amorosa: The building almost eclipses the wines at Castello, a faithful reproduction of an Italian castle. That's what makes their tour so much fun. The fully-equipped dungeon is often a big hit with kids of all ages. You'll be better off to reserve ahead any time, but they do accept walk-in visitors if they have room. Beringer: Napa Valley's oldest continuously-operating winery is famous for white zinfandel wine and visiting can be a "cattle call" experience, but their Historic District Tour takes you out of the crowds to the historic Rhine House, one of California's most beautiful structures. 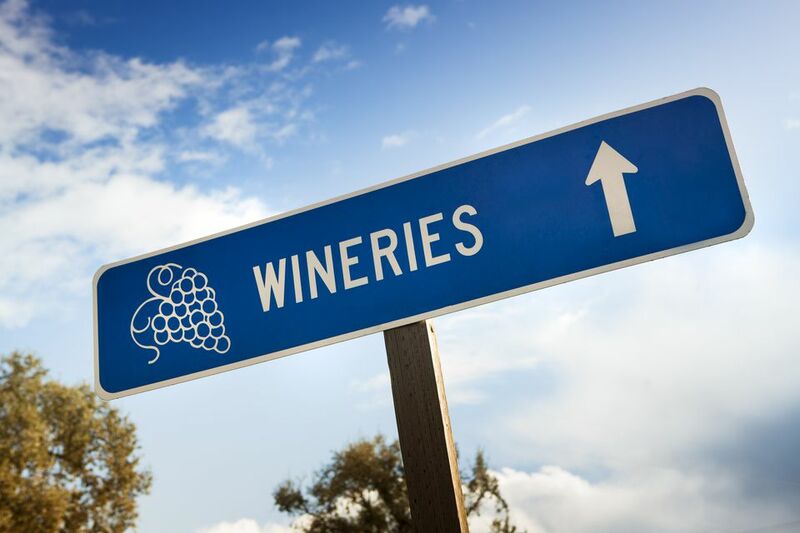 Robert Mondavi: Although it can be crowded, Mondavi offers many informative tours. Most wineries focus their visitor experience on how their wines taste by themselves. That's nice if you're a wine snob, but most of us don't consume wine that way. Instead, we drink it with food. Some wineries that advertise food and wine pairing just shove a Saran wrap-covered paper plate of cheese or other nibbles at you during the wine tasting and leave you to figure out what to do with it. That's not so helpful in my opinion, and it doesn't create an experience you'll still be talking about weeks later. A few winemakers focus on creating wines that taste good with food, and some wineries prepare their food and wine pairings with as much care as they make their wines. Those are the kind of places I want to go for a food and wine pairing, and I'm guessing that's where you want to go, too. Quite a few Napa wineries offer food and wine pairings, but few do it as well as Round Pond Estate, which is my favorite food and wine experience in California. At Round Pond, you get a real taste of “terroir” not only in their wines but also in their estate-grown olive oils, all paired with seasonal produce from the chef’s on-site organic garden. Their dense and elegant Gravel Series wines are the best of their best, made from grapes that grow on fingers of gravel created by the Napa River and Conn Creek, identified in a painstaking, twelve-year process the involved flyover infrared mapping, leaf bombs, and water content measurement. During their Il Pranzo experience, you’ll get a chance to enjoy Round Pond wines and olive oils. Allow up to 3 hours to enjoy yourself at a leisurely pace. Far more than just a few bites of this and that, you'll get a satisfying meal. They also offer a Garden to Table Sunday Brunch and a Signature Tour that includes a ride around the estate in their cute, red truck. Several wineries offer wine and chocolate tastings, but the players change from time to time. At the time this was last updated, these wineries offered a special wine and chocolate experience, but before you show up there and are disappointed, check ahead. Del Dotto Vineyards: Their informative barrel tasting tour always ends with port and chocolate truffles. Castello di Amorosa: They offer a wine tasting paired with chocolate, which is an add-on to their Reserve Tasting experience. Peju Province sells wine-infused chocolate sauces. Prager Portworks in St. Helena makes a fine port-and-chocolate drizzle and port-filled chocolates, too. Your best bet for wine and chocolate pairing in Napa may be to do it yourself, getting your chocolate and wine during your day's adventures. Picking the right pair isn't easy, but these tips will help you do it. Annette's Chocolate Factory on First Street in downtown Napa offers a variety of chocolate sauces made with wines and liqueurs. At Vintage Sweet Shoppe in Napa's Hatt Mill, the Dever Family creates wine-filled chocolate truffles that make an excellent (even if short-lived) souvenir or gift for the folks back home. At Woodhouse Chocolate in St. Helena, the chocolate candies are as pretty as they are tasty, miniature works of the chocolatier's art, displayed in cases that would be at home filled with jewels from Tiffany's. Free wine tasting is almost unheard-of at Napa Valley wineries these days, and every year, the list grows smaller. In fact, when doing this year's update, I found two of four wineries that offered free tasting last year have now changed their policies. If free wine tasting is what you're looking for, you may be better off to head for Sonoma instead, where almost half the tasting rooms don't charge a fee. The few Napa wineries with free tasting are hard to keep up with. Many online resources are out of date, listing wineries that have no tasting room at all and others that charge as much as $35. I'm here to keep you from being misled - or disappointed. I'm trying hard to keep this list updated, and as of early 2017, these Napa wineries have free wine tasting, but I advise making contact before you go, just to confirm that their policies haven't changed. Heitz Cellars just south of St. Helena has enjoyed sharing complimentary tastes of their wines since 1961. They are known for their cabernets, but also make an excellent port. Vincent Arroyo Winery in Calistoga offers free tasting for groups of four or fewer. Petite Sirah is their signature wine, and all visits require a reservation. Neal Family Vineyards on Howell Mountain doesn't charge for tasting, but they will charge a cancellation fee if you don't show up or cancel on the same day. Tours and tasting are available by reservation only. A few Napa Valley wineries refund your tasting fee if you buy a bottle of their wine. That's not a bad deal, considering that you were going to pay for the tasting anyway and now you have something to take home with you. Smith-Madrone: There's no pretense at Smith-Madrone, no fancy tasting room and no one telling you what you should be tasting at this winery above St. Helena, where it's easy to imagine what Napa was like 40 years ago. They no longer offer free tastings, but they will waive the fee if you buy a bottle of wine. And the owners are so much fun to talk to. Check this list (and then verify with the wineries lists) to find more places in Napa that offer complimentary wine tasting with purchase. If you can't get your wine for free, then cheap is the next best thing - or at least I think so. Here's a simple way to save money on wine tasting in Napa: All you have to do is share your tasting with someone. One glass, two people, sipping from it. It's a tactic my honey and I use quite often. Not only does it save money, but it can be romantic - like drinking an old-fashioned milkshake with two straws - and it keeps the intoxication level down, too. Downtown Napa Wine Tasting: This wine tasting option isn't quite free, but it's close. If you buy a Taste Napa Downtown card, you can taste for half price at any of a dozen or so downtown Napa tasting rooms. If you download the WineryFinder app from eConcierges, you can use it to find discounts and coupons. Most of their deals require you to check in at the property and take a photo to post on Facebook or Twitter. You might also find a good deal on wine tasting, food, and wine pairing as well as winery tours at Groupon. Many Napa Valley wineries also offer complimentary or discounted tasting for locals. So exactly what is a boutique winery, anyway? There's no formal definition, but in general, they're wineries that produce a smaller volume of wine than their neighbors. They're usually family owned, passionate about what they do and they want to have a strong personal connection with their customers. Sometimes, they make really great wine, too because they can focus on doing just one really well. Napa's boutique wineries are just the place to find an extra-special wine tasting experience. You might just find the owner giving a tour or the winemaker in the tasting room - and they'll be happy to see you. In pricey Napa, it's hard for these smaller winemakers to get started and stay in business, but these are a few places that I have visited and loved the experience. Smith-Madrone: There's no pretense, no fancy tasting room and no one telling you what you should be tasting at this two-man winery in the mountains above St. Helena, where it's easy to imagine what Napa was like 40 years ago. Ma(i)sonry Vintners Collective: You may not find the winemakers here, but you will find get a chance to sample products from smaller wineries. Kick back in the late afternoon at Ma(i)sonry in downtown Yountville to try wines from their vintner's collective, places so small that they don't have their own tasting rooms. Many Napa Valley visitors - and a lot of people who live there - can imagine nothing more enjoyable than a picnic at a nice winery. Surprisingly, it's hard to find a place to do that in Napa Valley. Few Napa wineries have picnic areas, and they're not just being snooty. Here's the reason in one small sentence: Everybody loves a picnic at a winery except Napa County. Because of local laws, picnicking is prohibited at most Napa wineries, including those with the best views and the biggest names. If you've been dreaming of that perfect Napa Valley winery picnic, don't despair. There are a few Napa Valley wineries with really nice spots for an alfresco meal. If you stop at any of them for a picnic, don't bring wine from another winery. And don't be a freeloader. It's polite to buy a bottle of their wine. They'll even be happy to uncork it for you. Clos du Val: Located on Silverado Trail, Clos du Val winery has a nice picnic area in an olive grove. Tables are limited, so reservations are strongly encouraged. You can also enjoy a private wine tasting and picnic experience under the olive trees at Clos du Val. They call it Family First. Folie a Deux: The name is French for "A Madness Shared by Two," but this winery is anything but out of its mind. Their winery (and picnic area) is on CA Hwy 29 next to Mustard's Grill. Rutherford Grove: Their picnic tables are available for use after a wine tasting or with a minimum purchase of wine in their tasting room. Rutherford Hill: On a hillside shaded by California live oaks, the picnic area is so beautiful and so popular that they charge to use it. Although their fee seems expensive, it includes three bottles of wine to help lubricate your picnic. Other websites and resources that publish lists of Napa wineries for picnics include more wineries than are on this list, but if I can't confirm it, I'm not going to lead you astray. If you find another place where you want to have a picnic, check the winery website or call to confirm before you go. V. Sattui also has a picnic area, but it's on a busy highway, always packed with people, and they don't allow outside food. Sometimes Napa Valley wineries start out well. They're fun to visit, welcome everybody, and the word spreads. Unfortunately, things can go very wrong after a place has achieved a name. The visitor who arrives two years after a location was proclaimed to be "the best" may wonder what happened. They find big crowds served by impersonal, hurried staff and wonder what all the fuss was ever about. It's happened to me - more than once - and I'm here to try to keep it from happening to you. It's not that any of these places are terrible, but they are all too busy to pay attention to their visitors and often overrun by big tour groups. If your heart is set on a visit to any of these wineries, don't let me stop you - but don't say we didn't warn you. Beringer: Because of their white zinfandel's popularity, Beringer sometimes feels more like a crowded bus station than a relaxing wine country stop. Avoid the main tasting room and opt for a specialty tour instead. Robert Mondavi: To avoid a herd experience, choose something specialized from their wide variety of tours. Viansa: Once a lovely hilltop winery with a nice outdoor cafe now seems always overrun, and I wonder why anyone stops there (except for the busloads who have no choice). V. Sattui: Once a great place for picnics on the lawn, these days it feels more like you're in the middle of a freeway, and they won't allow food brought in from outside. Frank Family Vineyards: This winery is generally well-rated, and I really hope that my experience was a one-time thing. But in case it wasn't, at least you know what to avoid. When I visited, the person hosting the Reserve Tasting was chewing tobacco and spitting into a bottle. Enough said. Francis Ford Coppola's Winery: It's not that you should avoid this one. In fact, it's a wonderful place to visit and here's why. But they moved out of Napa Valley. Coppola's winery and museum are now near Healdsburg in Sonoma County.